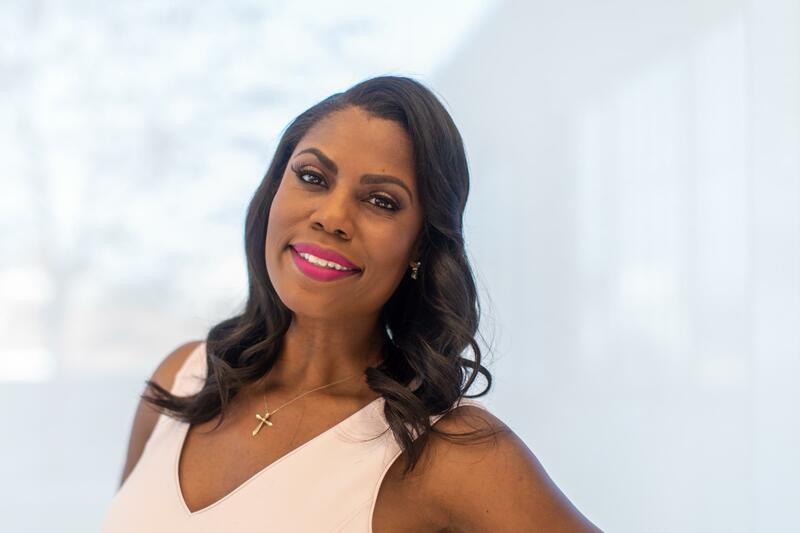 In her new book, Unhinged, former White House aide Omarosa Manigault Newman writes as a Trump world insider overjoyed at his election while airing concerns about his rhetoric, policies and mental state. Donald Trump and Omarosa Manigault attend The Ultimate Merger premiere at Trump Tower in 2010. Manigault appeared on the first season of The Apprentice and made later appearances on other Trump reality shows. When asked by Martin about the discrepancy during the interview, Manigault Newman insisted Martin must not have read the book (she had) and pointed to a section at the very end of it. But in that section, Manigault Newman doesn't actually describe hearing the tape. She writes of calling one of her "sources" who had a lead on the "N-word tape." On this phone conversation, I was told exactly what Donald Trump said - yes, the N-word and others in a classic Trump-goes-nuclear rant - and when he'd said them. For over a year I'd been so afraid of hearing the specifics from someone who'd been in the room. Hearing the truth freed me from that fear. And only now that it's gone, do I realize just how heavy it's been. During the interview with Martin, Manigault Newman read the section aloud, then insisted it described her hearing the tape rather than what the words on the page state, which is that she heard an account of what was on the tape. "I heard the tape," she said when pressed. Her search for the N-word tape is a core piece of the narrative Manigault Newman weaves in Unhinged, a memoir that covers her time on the reality TV program The Apprentice that starred the future president, then the 2016 Trump campaign and the White House. This discrepancy in her account of hearing the tape may cast doubt on other claims in the book, many of which are explosive. In Unhinged, Manigault Newman writes as both a Trump world insider, overjoyed at his election, and as a voice of the liberal resistance airing concerns about his rhetoric, policies and mental state. The once-loyal Trump aide, who often appeared on cable news defending her boss and singing his praises, was dismissed from the White House in December 2017; now, she says he is a racist, misogynist and may have dementia. Among other things, the book also claims Trump wanted to take the oath of office on a copy of The Art Of the Deal rather than the Bible and that she saw him swallow a piece of paper after an Oval Office meeting with his former personal lawyer Michael Cohen. The book represents an effort to repair her reputation and settle scores with her former colleagues. "I had a blind spot where Trump was concerned," she writes, later explaining that in her effort to help Trump win the election, "I focused my mind and energies on short-term Trump problems, which allowed me to avoid thinking about my own long-term Trump problem of having given him the benefit of the doubt for more than a decade, despite having many reasons not to." Asked why she has now turned on Trump, Manigault Newman told Martin it wasn't turning on him as much as putting the country first. "I made a commitment to uphold the values of this country and unfortunately being a part of this administration, I was very complicit with actually undermining those things, and I regret that," Manigault Newman said in the interview. Trump and Newman were a match made in reality TV heaven. When they met on the set of The Apprentice, he was a real estate developer turned personal brand salesman who wanted a hit TV show. She was a contestant intent on winning or at least becoming a star. In the book, she writes that before she went on the show, a friend gave her the following advice: "You can win without winning just by making sure no one forgets your name." Omarosa became a household name. Trump got the ratings he craved. Manigault Newman writes that she later came to suspect that he kept her close, bringing her back for multiple seasons of The Apprentice, then bringing her into his campaign and the White House, as a sort of a human antidote to charges he was racist or sexist. Going back through Trump's tweets from The Apprentice days, it's almost as if he could have been writing a review of Unhinged. "Omarosa always promises and delivers high drama," Trump wrote in March 2013. "She won't backstab-she'll come at you from the front." In an administration where facts are often in dispute and reality-TV-style drama seems to be a permanent condition, Manigault Newman's book falls into the growing genre of Trump-era tomes — on the line between incredible and unbelievable, but hard to verify or disprove in the absence of credible sources. After excerpts of the book leaked out, the White House responded. "Instead of telling the truth about all the good President Trump and his administration are doing to make America safe and prosperous, this book is riddled with lies and false accusations," said press secretary Sarah Sanders in a statement. "It's sad that a disgruntled former White House employee is trying to profit off these false attacks, and even worse that the media would now give her a platform, after not taking her seriously when she had only positive things to say about the President during her time in the administration." Fired for cause, or the N-word tape? When Manigault Newman departed the White House late last year, the official line was that she had resigned. The unofficial line, attributed to unnamed sources in numerous reports, was that she rushed to the residence to plead her case with the president himself after being fired. Manigault Newman starts her book telling her version of how it all went down, strongly disputing any of the high-drama, made-for-television antics reported about her departure. She writes that she had been hot on the case of finding outtakes from The Apprentice where Trump allegedly uses the N-word, when chief of staff John Kelly called her into the supersecure White House Situation Room to fire her. Manigault Newman says Kelly told her there were "significant integrity issues" and "pretty significant legal issues that we hope won't make it ugly for you." The only example she says she was given was her use of a government car to attend the Congressional Baseball Game, which she says was done in an official capacity. I asked whether the president was aware of this. "This is a nonnegotiable discussion." "I'd like the opportunity to understand," I said. "There were serious integrity violations," he said. Why was he being so vague? What violations? "The staff works for me, not the president. So after your departure, I'll inform him. With that, I'll let you go." What is he talking about? Where is this coming from? Quickly, I connected the dots. This had to be about the N-word tape. It's not entirely clear what causes Manigault Newman to arrive at this conclusion. She describes being escorted out, unable to even take her personal items much less run to the White House residence to talk to President Trump. She writes that she was on the verge of resigning anyway and that the N-word tape, had it surfaced, would have been the last straw. "I'd had one foot out the door since the mishandling of the Unite the Right rally in Charlottesville." Still, she is clearly upset about being dismissed and has no love lost for Kelly. There's a growing genre of Trump-era books that exist on the line between incredible and unbelievable. The newest entry is "Unhinged" by Omarosa Manigault-Newman. She went from breakout star of the first season of "The Apprentice" to senior White House aide. Now she is making explosive claims about her former friend and boss President Trump. But as NPR's Tamara Keith reports, a key claim in the book may be thrown into doubt by an interview the author did this morning with NPR. TAMARA KEITH, BYLINE: Manigault-Newman sat down with NPR's Rachel Martin for an interview that was supposed to air Monday on Morning Edition. But an exchange from that interview is both newsworthy and potentially damaging to a central part of the narrative Manigault-Newman weaves in her book. "Unhinged" starts and ends with Manigault-Newman's hunt for what she calls the N-word tape. On the eve of the election, rumors swirled that there were recordings from the set of "The Apprentice" where Donald Trump used the racial slur. A producer from "The Apprentice" named Bill Pruitt said in an interview that the audio existed, though to this day it hasn't surfaced. In the book, Manigault-Newman claims that she was forced to resign because she had gotten close to finding the tape. And the book ends with this - a call she made months after leaving the White House to someone who worked on "The Apprentice." Here she is reading the key sentence. OMAROSA MANIGAULT-NEWMAN: (Reading) On this phone conversation, I was told exactly what Donald Trump said. Yes, the N-word and others in a classic Trump-goes-nuclear rant. KEITH: This seems pretty clear. She didn't hear the tape but was told what was on it. But that's not what she said in her interview with Morning Edition. RACHEL MARTIN, BYLINE: You heard - you have heard this tape? MANIGAULT-NEWMAN: I heard this tape. MANIGAULT-NEWMAN: I heard the president of the United States use not only the N-word, but as Bill Pruitt described during that interview, other horrible things during the production of "The Apprentice." MARTIN: You don't mention that in the book, that you've actually heard the tape. Is this new? MANIGAULT-NEWMAN: Oh, no, it's mentioned in the book. KEITH: But what Manigault-Newman points to is that section she just read about the phone call. In the interview, Rachel Martin presses her to clear up the discrepancy. MARTIN: Forgive me, though. That sounds like you just heard his account of the tape. Did you actually hear the tape? MANIGAULT-NEWMAN: I did. Did you miss this whole - girl, did you read my book? KEITH: She did read the book. So did I. It's not there. In the book, Manigault-Newman makes many claims about President Trump and others in the White House that would be shocking if true - that he has dementia, that he referred to people of color as those people, that he wanted to be sworn in on a copy of his book "The Art Of The Deal" rather than the Bible. There's a lot. White House press secretary Sarah Sanders put out a statement that says in part, quote, "this book is riddled with lies and false accusations. It's sad that a disgruntled former White House employee is trying to profit off these false attacks and, even worse, that the media would now give her a platform after not taking her seriously when she had only positive things to say about the president during her time in the administration," unquote. Those days are clearly over. MANIGAULT-NEWMAN: Donald J. Trump is not only a racist but a misogynist and a bigot. KEITH: Manigault-Newman told NPR it was hard to see those things when she was part of Trump's orbit. MANIGAULT-NEWMAN: But the things that I heard come out of this man's mouth on the tape that I describe in this book - it completely shattered my belief in him being a decent person. KEITH: But a big question now hangs over it all. Did she actually hear the tape as she claims now, or did she simply hear a description of it as she says in her book "Unhinged"? Tamara Keith, NPR News. Transcript provided by NPR, Copyright NPR.